Control your PC music software and/or MIDI sound modules and sequencers using this 25-key MIDI Keyboard Controller from Monoprice! 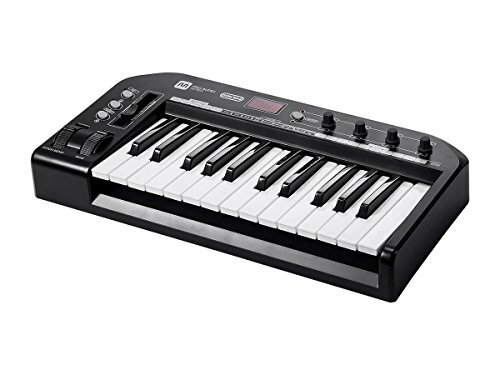 This 4-octave, velocity sensitive MIDI keyboard controller features a USB port, which allows you to connect to a computer for use with your favorite music creation software or with software synthesizers or sequencers. It also includes a 5-pin MIDI DIN output, for connecting directly to sound modules or sequencers. This powerful controller allows you to map almost any function to almost any button, knob, slider, or wheel. Built-in functions include the ability to quickly adjust the octave range up or down, or to transpose the keys for easier pitch changes. A pedal jack allows you to connect a sustain or expression pedal for additional functionality. This is a true, driverless plug and play device for use with Windows and Mac PCs or as a standalone MIDI controller.